Recently I was in a conversation with a standards development person, and an interesting (and new to me) turn of phrase was used. ISO9001:2015 was called an “agnostic” standard by which my colleague meant that it would be generally applicable to every business or organization regardless of sector. To me, agnostic has a very different meaning, a “don’t know, don’t care” attitude towards religion. At first I thought that referring to a standard as agnostic was borrowing from religious terminology rather pedantic, but upon reflection I realized that referring to a standard as agnostic is a high compliment. In its purist form agnostic is derived from early Greek; “a” meaning “without” and “gnosis” meaning “esoteric knowledge” or “dogma”. I can’t think of a better way to refer to a standard describing it as being “without dogma”. The Quality movement has tried to the extent possible to be agnostic and even scientific. There is effort to stay away from devolving into its own belief system or esoterica or dogma. In many instances it has been successful; in other places, to my mind, not so much. The other day I was reading in ASQ’s November issue of Quality Progress, and came around to an article by Matthew Barsalou entitled “A Better Way” in which he means a better approach to performing Root Cause Analysis (RCA). With no disrespect for Mr. Barsalou intended, in my mind, I find it difficult to put the words “Better Way” and “Root Cause Analysis” in the same sentence. I cannot think of anything more the opposite of “agnostic” than the concept of root cause analysis (RCA). To my mind RCA is the very poster child of dogma in Quality. In the medical laboratory, it is an absolute that the investigation of nonconformities requires a Root Cause Analysis. Accreditation bodies spend all sorts of time expecting laboratories to have RCAs for every proficiency testing error, every audit deficiency, and every complaint. That is a requirement in ISO15189:2012 (medical laboratories – requirements for quality and competence) and also in ISO17043:2010 (Conformity assessment -- General requirements for proficiency testing). While I don’t have my copy of ISO/IEC ISO/IEC 17025:2005 (General requirements for the competence of testing and calibration laboratories) close at hand, I am almost certain it is in there as well. To their credit, the crafters (ISO TC176) of ISO9001:2015 (and its previous iterations) did not use that phrase; instead it simply says to “review, analyze, and determine the cause, and the determine if similar nonconformities exist or could exist”. (Personally I would prefer a small but critical variation – “determine the possible or probable cause…). RCA assumes that if you know that a bad thing has happened, a knowledgeable person can trace back to the point of origin which indicates the root of the evil outcome. It’s like Stephen Hawking’s tracing back to the origins of time. RCA is totally dependent on the assumption of traceable knowledge. Putting that level of faith in RCA flies directly in the face of important concepts like, Mathematical Chaos Theory, Knightian Risk, and Risk Management and the whole science of uncertainty. Chaos Theory is the mathematical model that informs that every cause leads to an effect, and every effect has a cause. 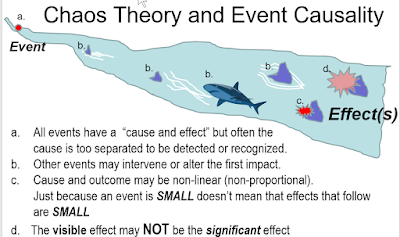 Causes and effects are non-linear, in that small cause may have big effect, or not. Once causes occur the ripples that result can be altered, buffered, changed before the effect manifests, and the greater the time interval between the cause and effect, the more likely alterations occur. And finally the “effect” you see may not be the significant effect. That does not mean that we can just shrug our shoulders and soldier on. We can and should do a look back and see if there is a possible or probable error that could account for our problem. Sometimes it comes down to maybe a slip or a distraction, or perhaps an error in the procedure. More often than not, it is little more than a supposition, unless there has been two or three events (boo hiss!) when at least you can look for common factors. You can try to layer in another piece of swiss cheese (think James Reason). And then monitor to see if the problem stops happening. So let me argue, that the time has come that we can follow the lead of the crafters in TC176 and get rid of the phrase “Root Cause”. We can look and we can investigate and sometimes we will find a possible or probable cause. Just so long as we don’t make the transition from investigation to blame. Quality is about a lot of things, but laying blame is not one of them. But maybe that’s just my own Dogma. Note: a critical spelling error was found, and amended. My apologies to any who might have been offended.